Rules are made to be broken, and that couldn’t be truer for wedding cakes. So why not go for something a little unusual with yours? When it comes to wedding cakes, there’s a tried and trusted formula that most couples follow. Fruitcakes covered in white icing and then displayed in a tier, usually with some floral decorations or a cute little topper. There’s no doubt that that’s a timeless style, and will look great at any reception. What if you want to buck that trend though? Well, you’ve come to the right place! 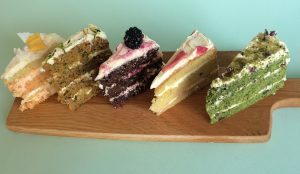 We’ve come up with some great alternatives to the traditional wedding cake, all of which will wow the guests at your wedding venue in Essex and most importantly, taste utterly delicious. Not everyone has a sweet tooth, so why not opt for a savoury wedding cake? 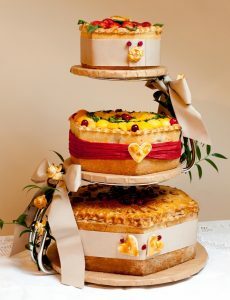 There are lots of different variations on a savoury wedding cake out there, including a cheese cake. 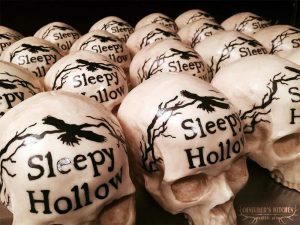 Yes, you heard that right! 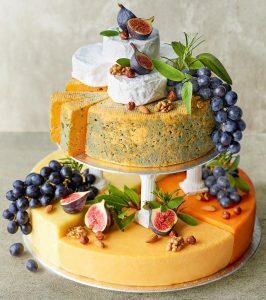 Wheels of cheese stacked in a tier make for a really eye catching cake alternative. The same goes for pies, which have the added benefit of being able to be as ornate or simple looking as you like. You could include a fruit pie too, for those who just can’t resist something sweet. Not everyone likes fruitcake, so why is it expected that you’ll have it as one of the tiers of your wedding cake? There are so many incredible kinds of cake that you could have instead. 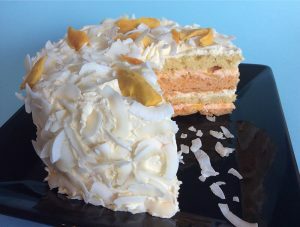 Sponges with exotic buttercreams like pineapple or passion fruit, sumptuously scarlet red velvet cakes, or something incredibly decadent like a chocolate or coffee cake. Just remember, sponge cakes won’t last for as long as a fruitcake, so you’ll have to be quick eating those leftovers! A gothic inspired cake with some gorgeous black detailing is perfect for less traditional weddings. If you’re not one for white, go for a cake with some vibrant patterns, colours and shapes instead. If you’re throwing a retro wedding reception, go for leopard prints, bright colours and wacky shapes – maybe something like a vintage car? When you throw away the rule book, anything is possible! Another cake option that’s rapidly gaining popularity is having lots of individual cakes rather than a single one. This is a great idea as everyone can help themselves, and there’s no time spent cutting up the cake at the end of the evening. You could opt for cupcakes, macaroons, brownies or even doughnuts. 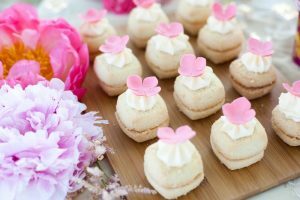 You can have as many different varieties as you like, which is particularly useful if you’re catering for guests with lots of different dietary requirements. As you can see, there are plenty of alternatives to a traditional wedding cake. We’re seeing more and more couples break the mould; and a striking and unique wedding cake really does make a for a great talking point, and later on down the road, some wonderful memories. So if you’re planning to share your special day with us, then why not go for something a little different? After all, no couple is the same, and no wedding celebration should be either! Choose a wedding cake that works for the both of you, and make your day even more special. Our brochure is a fully comprehensive reflection of what we have to offer. From our special Wedding Ceremony room, to our Baronial Hall Barn, it is no wonder that we are considered the venue for all occasions.